Saturday 30th MARCH - Snowbee Innis Spring Cup - Everyone welcome. £50 Entry fee, which includes presentation and Hog Roast dinner afterwards. You can pick up an entry form from the fishery or contact us on 01726 852382 and we can send one via email or post - Places are only secured on receipt of entry form and £30 deposit. Places are filling up quickly for this event, which will be sponsored by SNOWBEE. The company have been very supportive of The Innis Spring Cup for many a year, lavishing cash and prizes for those that are successful on the day. 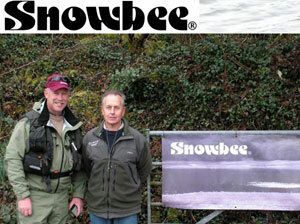 SNOWBEE representative Simon Kidd with Innis owner Dave Johns. PLEASE NOTE on the 30th March Carbis & Sterrick Lakes will be closed while the fishery hosts the Spring Cup. If you wish to fish on this day then details apply as below. on SATURDAY 30th March the Innis Specimen Lake will be open to non competitors normal fishery price for the Innis lake will apply ..Innis Lake is stocked with some double figure fish so all tippet line will have to be a minimum 8lb breaking strain. Innis Lake pictured above is regulary stocked with Double figure Specimen Fish and can be fished while other events may be taking place. Today saw the annual running of the Butch Johns Memorial Trophy, this competition has now been running for 30 years. 18 anglers braved the galel force winds today and caught a total of 96 fish, ranging from 2lb to 4lb. This years winner was Andrew Willoughby with 17 points catching 13 fish, taking home the perpetual Butch Johns Trophy and a First Place trophy. Second Place went to Paul Nottle catching 9 fish and Third Place went to Dave Perks also with 9 fish. Thanks again to everyone who continues to support this competition...Hopefully see you all again next year.